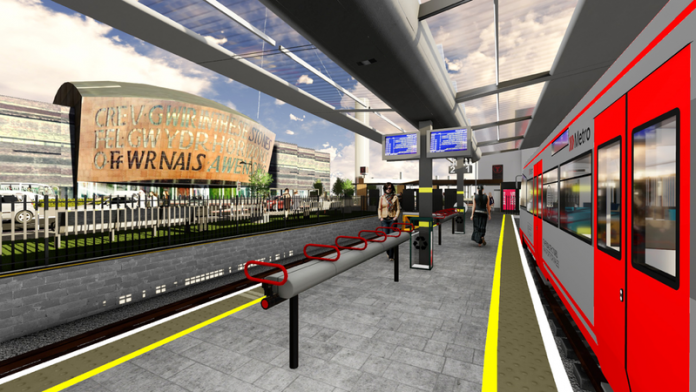 Welsh transport secretary Ken Skates has announced that nearly £100 million will be invested in a new Transport for Wales (TfW) train depot for the South Wales Metro. This depot will be used to house and service 36 new metro vehicles operating on the Taff Vale lines. The announcement follows a busy week for the country’s railways after the government awarded the Wales and Borders rail franchise to KeolisAmey and detailed how £5 billion will be spent improving services. In total, around 400 train crew, 35 metro vehicle maintenance staff and a South Wales Metro integrated control centre employing 52 staff will be based at the depot. Clearance and construction work for the new depot is expected to start in 2019 and be completed by the middle of 2022. An existing South Wales depot at Canton will also benefit from a £5 million investment to modernise maintenance facilities so it can support new tri-mode rolling stock being introduced as part of the new service. There will also be investment in enhanced stabling facilities in Treherbert and Rhymney, and an upgrade of the station at Rhymney to accommodate more and longer tri-mode rolling stock. Ken Skates said: “Public investment with a social purpose is right at the heart of our new approach to rail and in line with our Economic Action Plan, and we are determined to ensure that our £5 billion investment in rail services maximises opportunities for Welsh business, stimulates the Welsh economy and develops the local skills base, creating and supporting as many local jobs as possible. Brilliant news for Wales. New trains to be built in Wales. Aswell new jobs created that the new trains will replace the older trains and to provide better services in Wales. Once the new franchise has taken over from Arriva in October this year. Andrew. This article is not referring to the new CAF factory at Newport but a depot at Taff Wells for servicing the proposed South Wales Metro vehicles, that will run on the Valleys north of Csrdiff.